You can turn all of your favorite chicken recipes into chicken drumstick recipes. In fact, because all the drumsticks will be about the same size, it may be easier to cook just the drumsticks. Usually when you are cooking chicken you run into a little problem. The white meat cooks faster than the dark meat does and so you end up having to start the white meat later, or pulling it out of the oven sooner. Either way, you spend more time juggling dinner than making dinner. 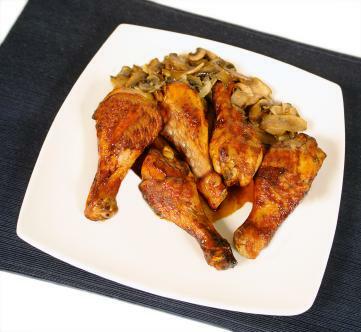 It can be very frustrating, but if you are only cooking dark meat, for instance if you are making some chicken drumstick recipes, then everything will be cooked at the same time. For example, if you are frying chicken or making an easy chicken recipe, you can cook more chicken pieces at the same time and they will all be done in the same amount of time. Another advantage of cooking only drumsticks is that, like wings, they make a great party food. You can usually buy a large amount of drumsticks for cheap and chicken drumsticks are the perfect size and shape to eat while mingling. Teriyaki sauce is simply soy sauce that has been reduced (simmered down to thicken it) with brown sugar and any other flavorings that you happen to like. Any chicken drumstick recipes that you like can also be used to make wings, but because wings tend to be tougher than drumsticks you might want to bake the wings for a few minutes before continuing with the recipe. Using a large pan, add enough oil to the pan to just coat the bottom. Place the pan over a medium high heat. Once the oil begins to shimmer, add the chicken drumsticks. While the chicken is cooking, whisk together the rest of the ingredients. Once all sides of the chicken have been browned, add the soy mixture to the pan. Bring the mixture to a boil and then reduce to a simmer. Simmer the chicken, turning occasionally, for 30-40 minutes or until the chicken is completely cooked. Remove the chicken to a platter and pour the sauce over the chicken. You could also pour the sauce into a bowl and let your guests dip the chicken, as they like.